Note: This tour is for minimum 4 participants. 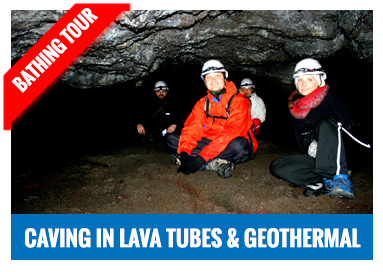 On this geothermal bathing and hiking tour you will see big lava fields, do some light hiking, bathing in natural hot springs and optionally visit Iceland's newest Geo thermal power plant and the Geo thermal exhibition there. The Geo thermal exhibition is at Iceland's newest Geo thermal power plant wich is only a 20 minutes drive from Reykjavík. There after we will dive through some exiting landscape and over rivers to Ölkelduháls. A 20 minute easy hike then brings us to the warm springs where we will take a dip in the warm pools and enjoy nature at its finest.